One of my great joys in life is to pick something to make when my sisters have a baby. 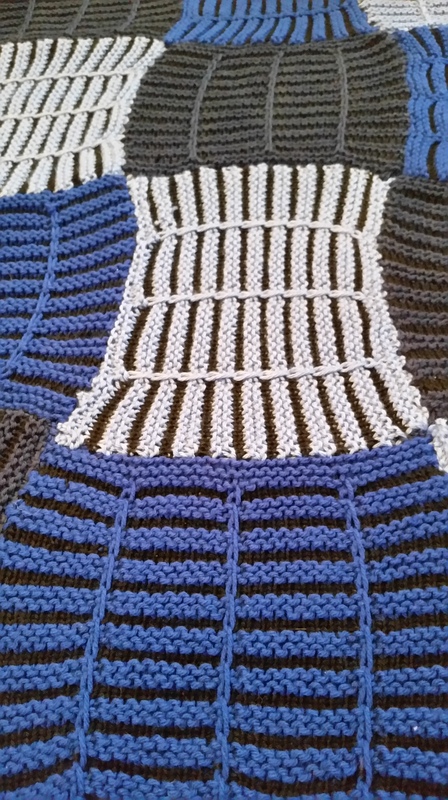 As you might know from reading my blog for awhile, I have a preference for making baby blankets. 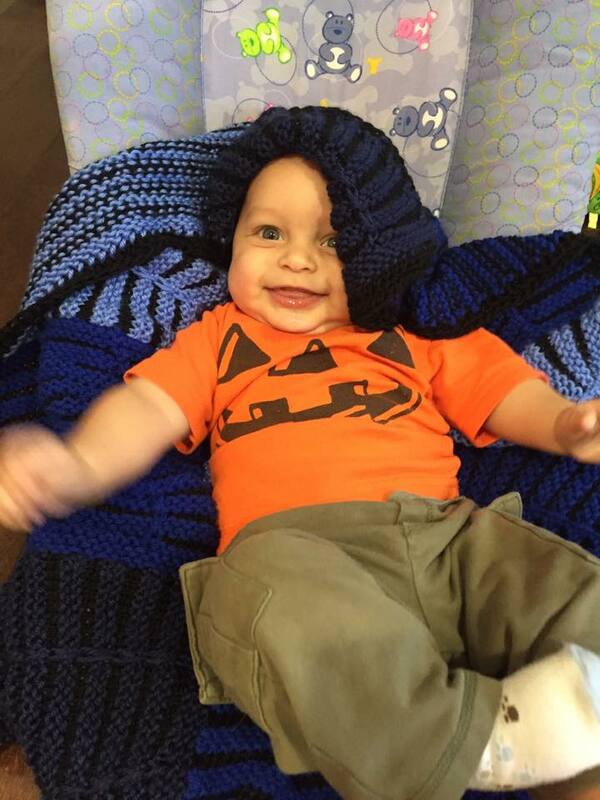 My choice for my newest nephew Antonio is a fun one. 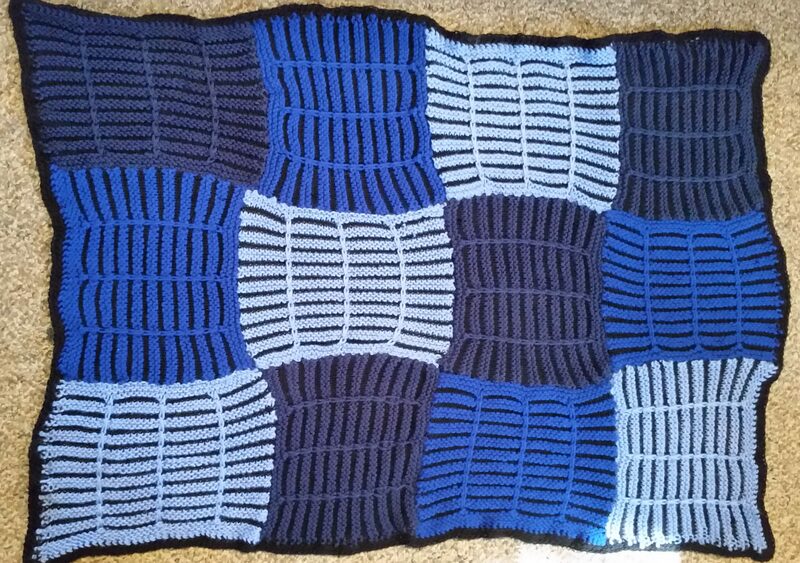 I went with a mix of blues with black trim, and resized this pattern into a baby blanket. 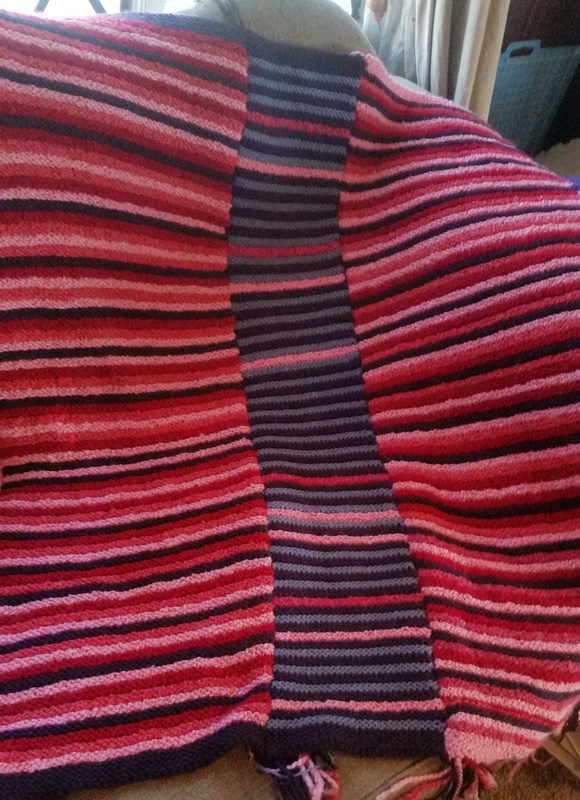 I am very wary of making blankets that have squares to seam together at the end. 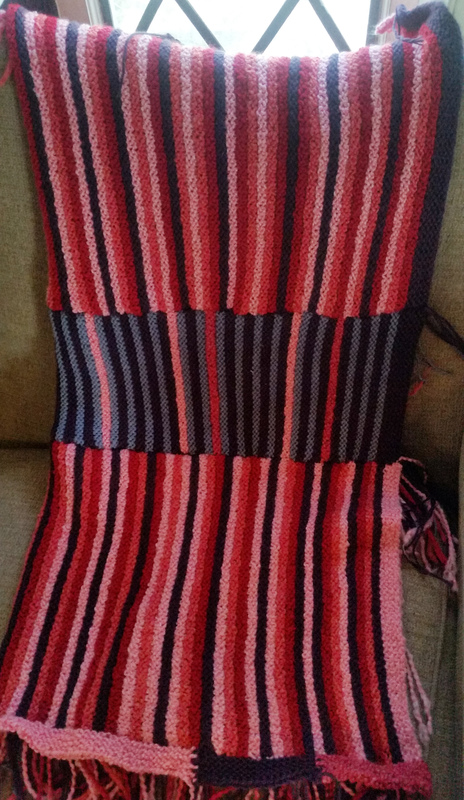 I once made a mitered square blanket that, no joke, took me longer to seam together and weave in ends than it did to knit the squares. 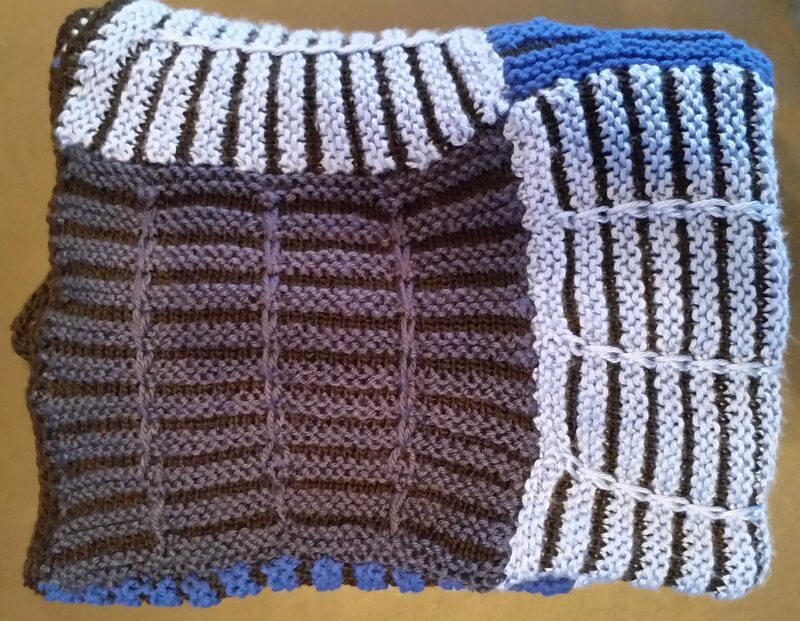 The only reason I saw 100’s through to the end was because most of the squares are picked up and knit, no seaming, so it wasn’t quite so bad. 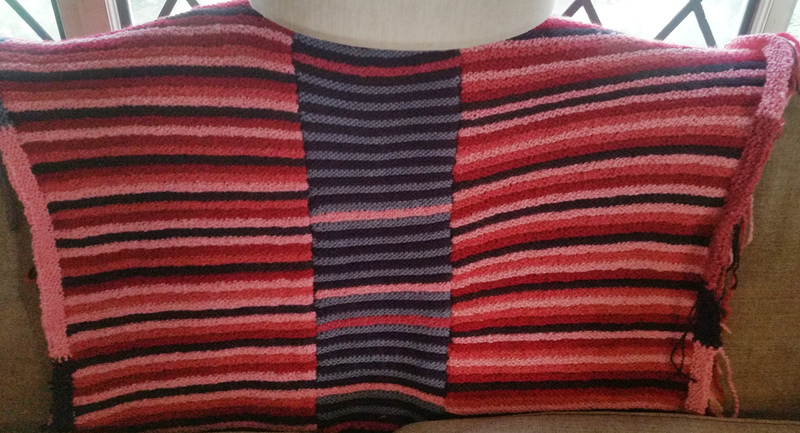 But back to this one, the seaming was very simple, and the squares themselves are big enough that it was actually fun putting it together sort of like a puzzle. I will not make a blanket with tiny mitered squares again, but I wouldn’t mind doing a full size version of this one for our home. As a designer, I think I probably do more swatching (and ripping out), than the average knitter. Part of figuring out a design is to experiment, and I accept this as part of the job. 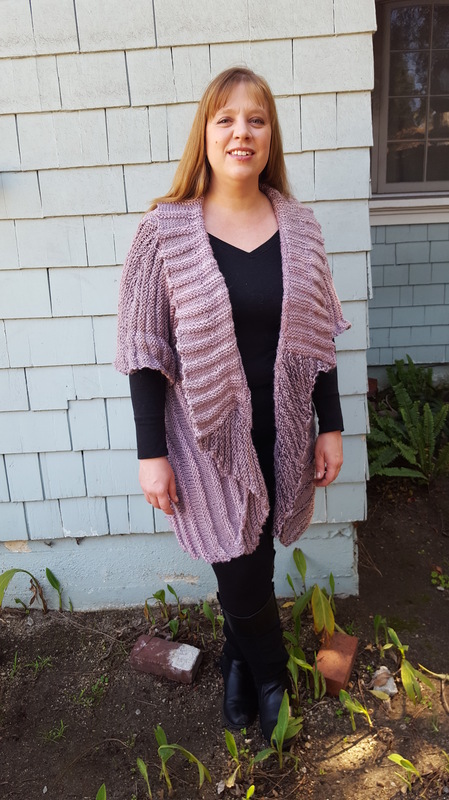 Deborah Newton is a big proponent of swatching for fun and says this is the most important stage of her design process. I am not sure how yarn companies decide what needle size to suggest on their ball bands, but it often functions as a starting point for me. If I’m starting a new project, and I’m not sure what needle size I want to use, I start swatching with the suggested needle size and then go up or down based on what fabric that makes and what kind of fabric I’m trying to achieve. Recently, I did a bunch of swatching with different yarns, and I started noticing a pattern. 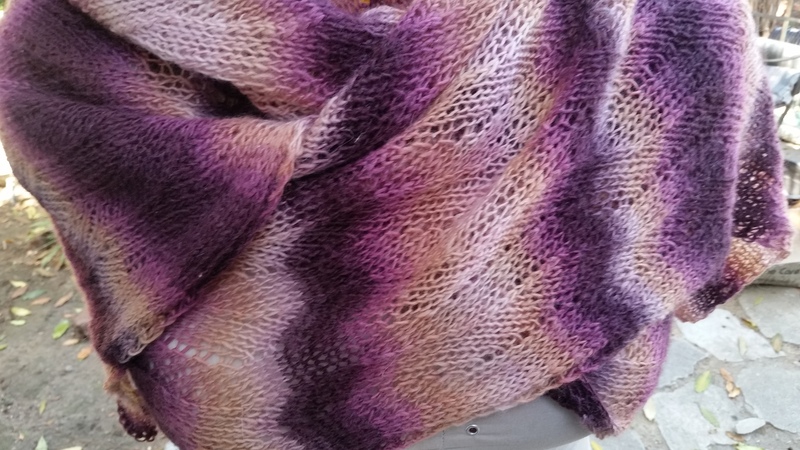 I realized that no matter the thickness of the yarn or the fiber type, every single swatch came out much more drapey when I went up a needle size or two from what is on the ball band. And I realized almost every knitted piece I’ve been most happy with has always been using a bigger needle size than what is on the ball band. 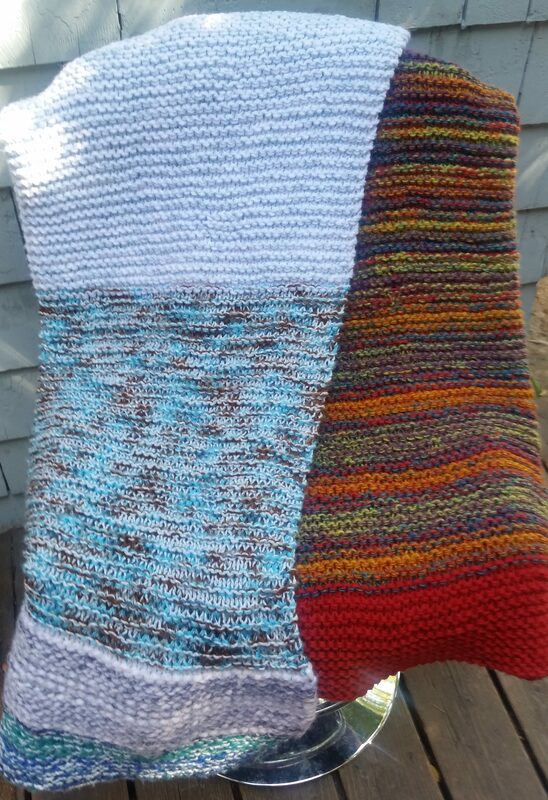 These two swatches are done in chunky yarn with the same number of stitches. 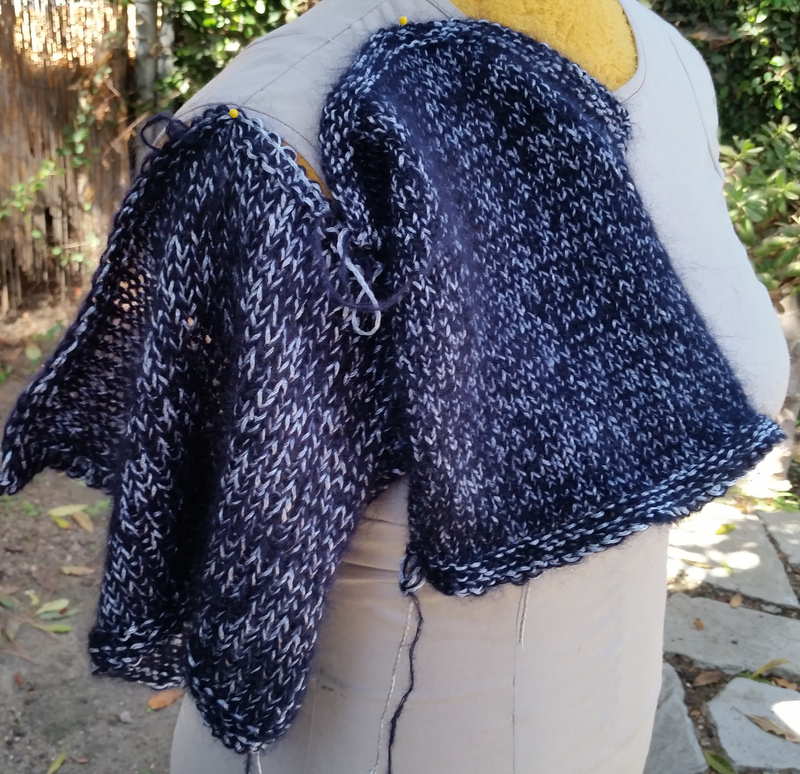 One is knit on size 11’s, and the other on size 17, and you can see the difference in drape. I liked what I was getting on the 11’s until I did the one on 17’s. Now the swatch done on 11’s feels and looks very stiff to me. Again, both swatches have the same number of stitches, just different sizes. This is a sport weight yarn done on size 6 and size 8. 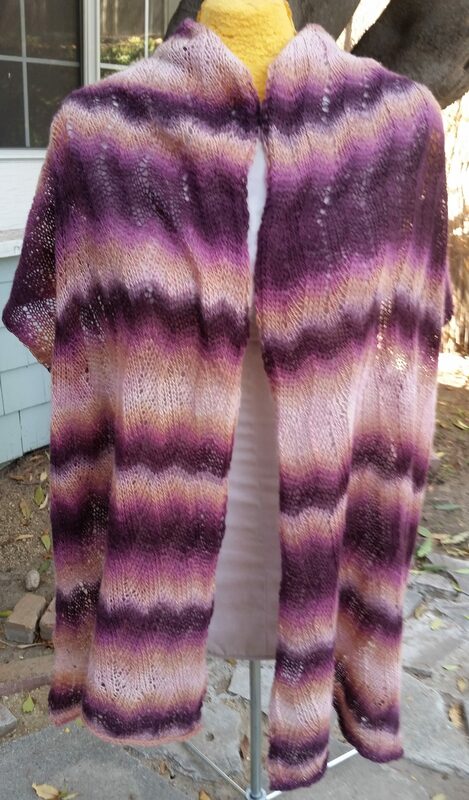 Again, I am happier with the drape of the swatch done on the larger size. 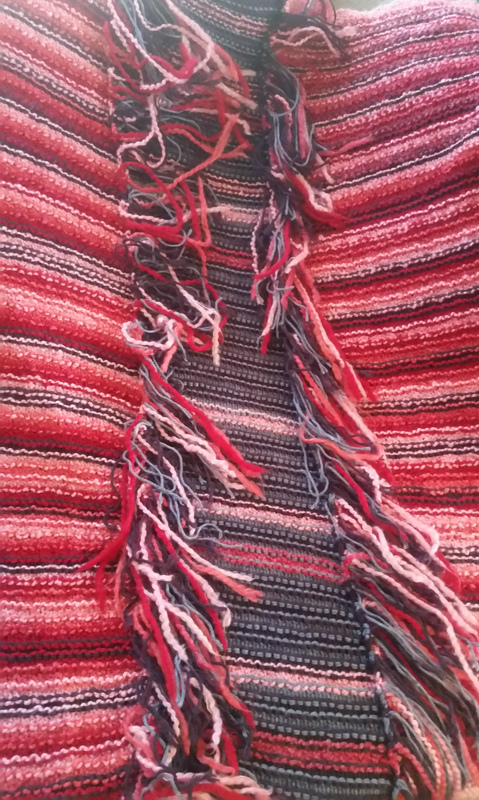 You get the idea – same number of stitches, this is double stranded done on sizes 7 and 11. 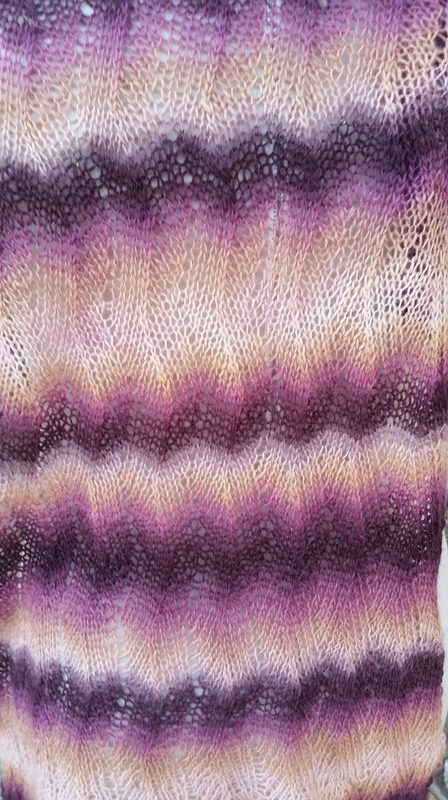 This one surprised me – I really loved the first swatch done on smaller needles, and was considering just going with that. 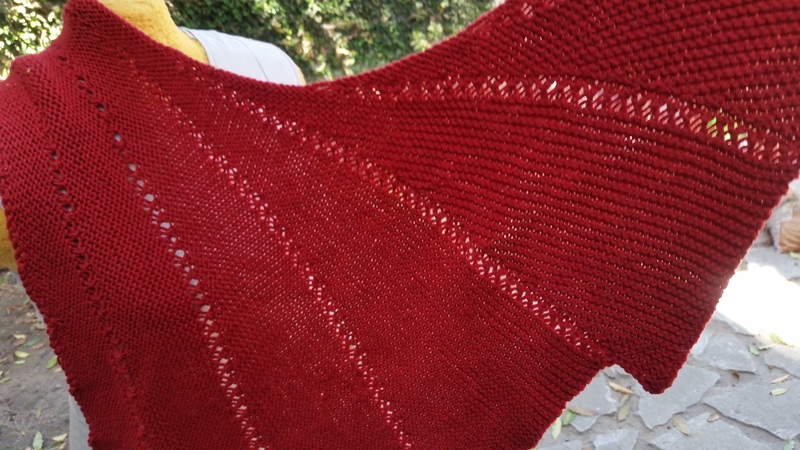 But when I did the second swatch, I realized what a difference in drape there was, and if I were to make a sweater out of this, I would definitely go with the larger needles. This would be the best tip I could offer fellow knitters: don’t be afraid to go up a needle size or more to get the best possible drape in your fabric. 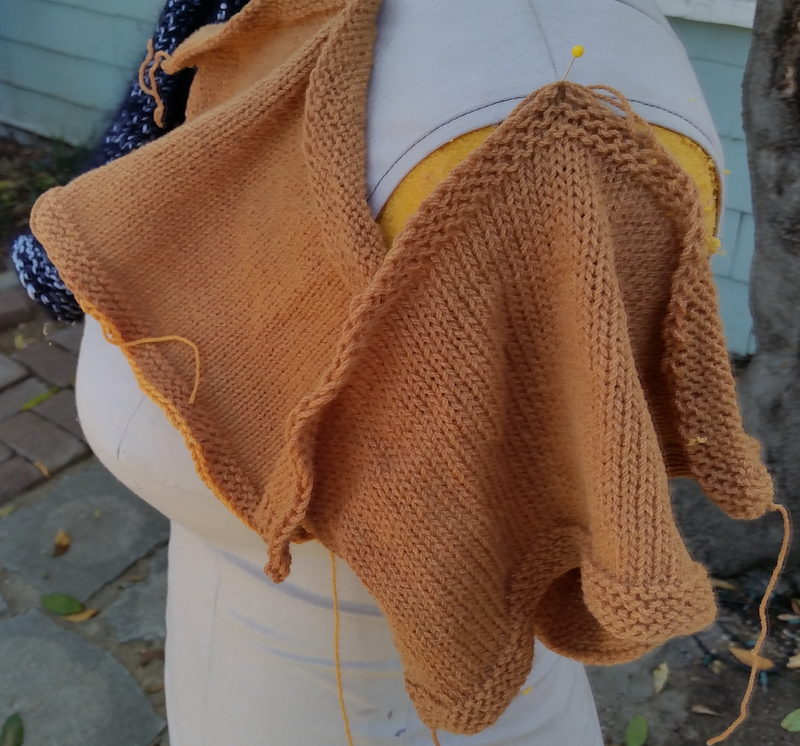 In all of these swatches, and usually in most of the projects I’m happiest with, the best drape has come from using needles at least 1 or 2 sizes larger than what is recommended on the ball band of the yarn. If you can spare the time, even if you like the swatch results, try it on larger needles and compare your swatches because you might be pleasantly surprised. This project is probably one of the oldest WIPs I had sitting in the back of my closet. 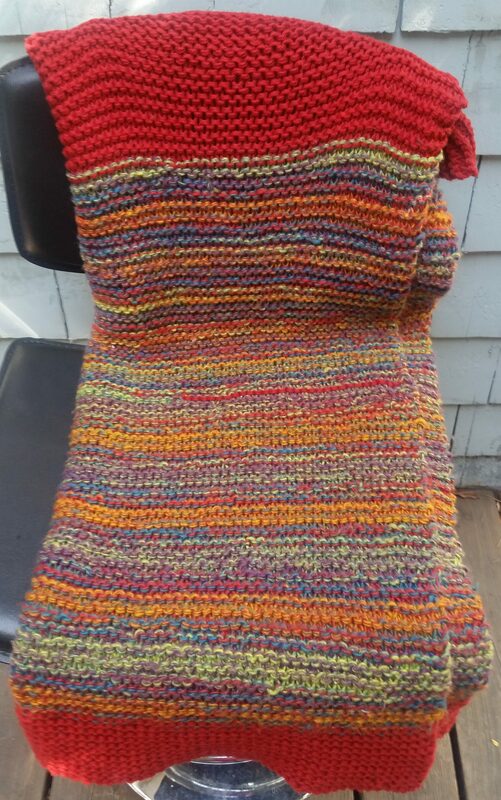 I started it 4 or 5 years ago, and knitted far with it. As in, it calls for 3 skeins of yarn, and I knitted through 2 before I quit working on it. 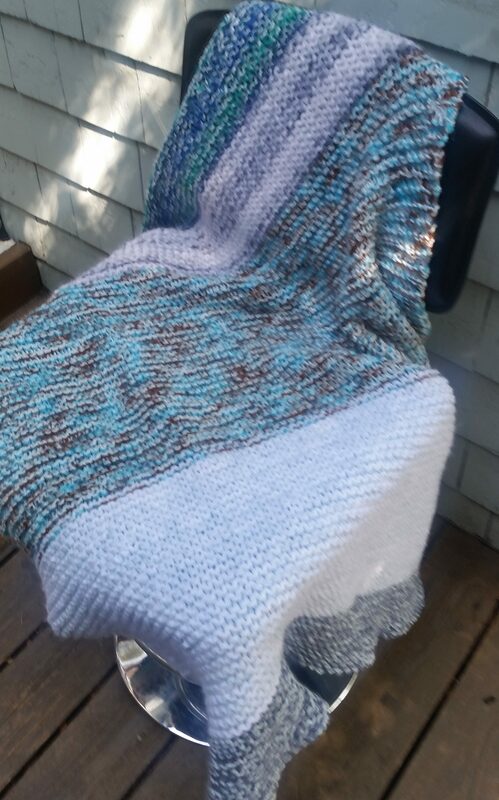 This was one of those projects where I loved the pattern, loved the yarn, and because I loved them both so much, I wanted perfection. I’m sure you know what is coming. 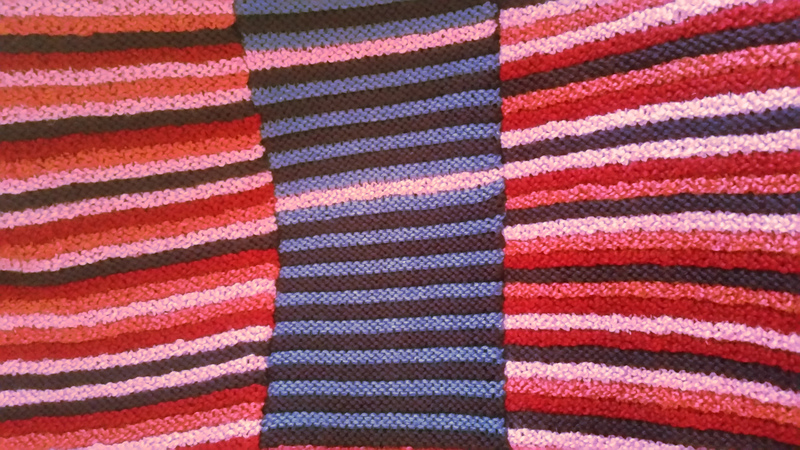 I made a mistake pretty early on, but didn’t notice it until I had knit several more inches. I pushed myself to just live with a mistake. Then I made more mistakes, and the whole thing just started to annoy me by the time I started the second skein. 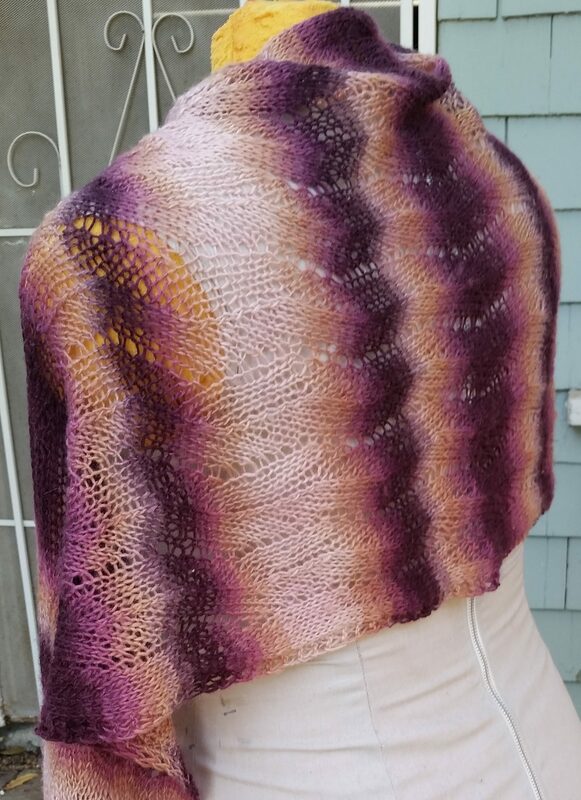 By the time I was finishing that skein, I was majorly irritated with myself and wishing I had just frogged it when I noticed the first mistake. But of course, being 2/3 done with it, at this point, I REALLY didn’t want to frog it, so I did what most of us do in such situations and decided to just shelve it for awhile. You know how it is, we always think if we put it aside for awhile, our mistakes will disappear by magic, or at least not bother us so much when we pull it back out after awhile. It turns out in this instance “awhile” was 4+ years, and when I pulled it back out over the summer, the mistakes were still there and glaringly obvious. Of course, there are two ways this can go when you’re in this situation: you can frog the whole thing and start over or you can frog it and repurpose the yarn for a different project. It really comes down to how passionate you feel about the pattern at hand. 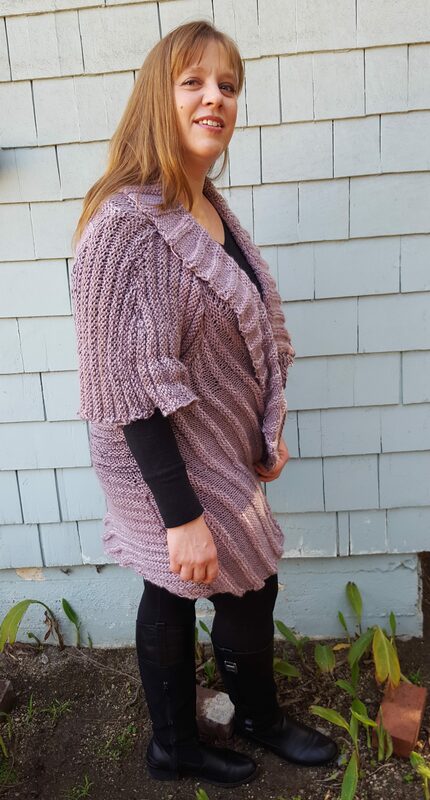 I decided to do the first because from the start, I loved THIS yarn with THIS pattern. 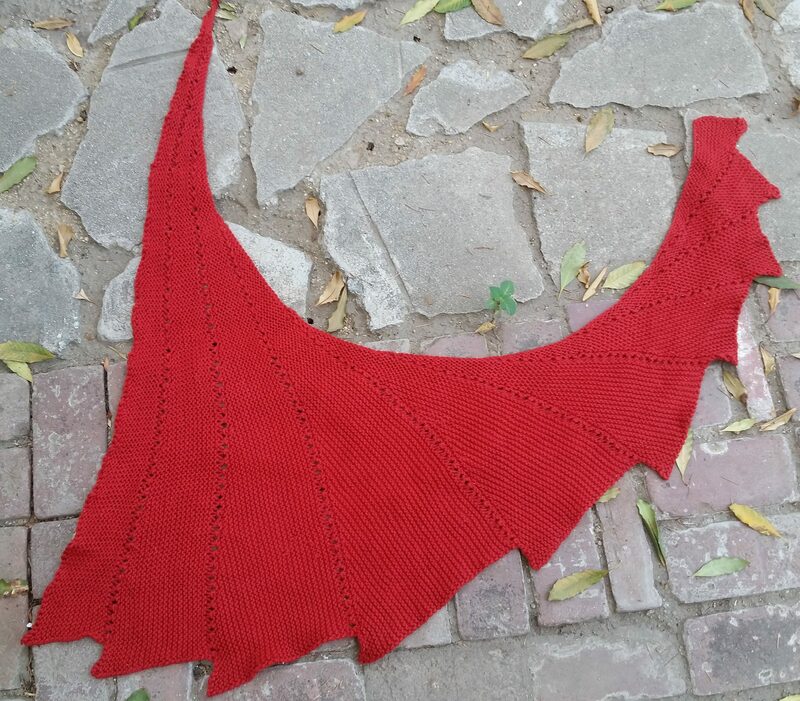 I love the shawl shape! Awhile ago, I mentioned I am working my way through a book about short rows. 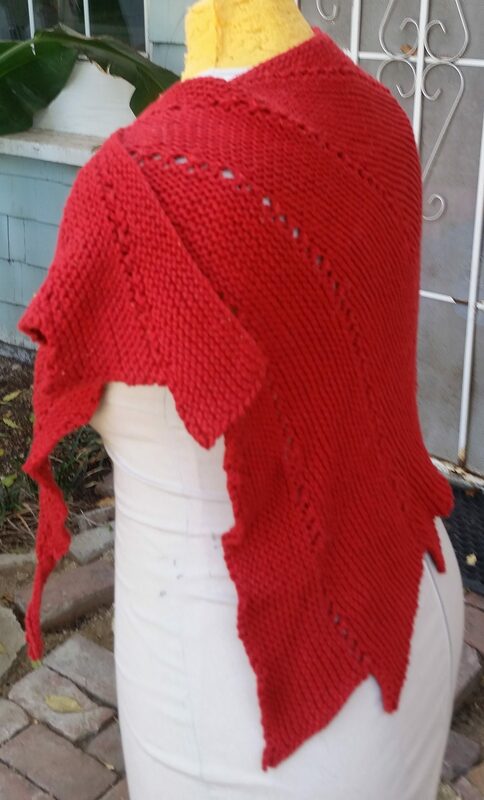 This shawl is the next project from the book, and was a very fun and fairly quick knit. 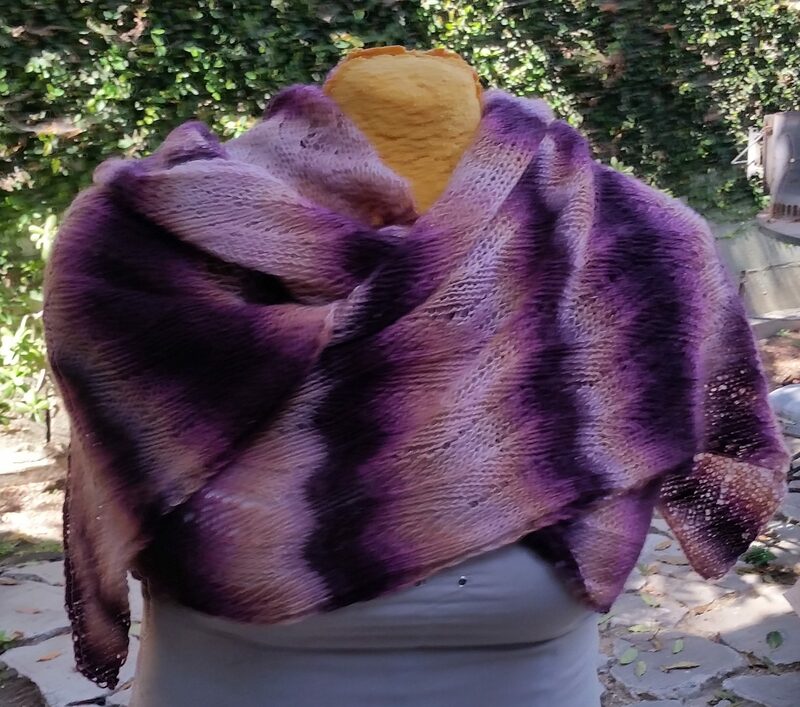 I chose to do it in cotton, but you could use any worsted-weight yarn you wish. 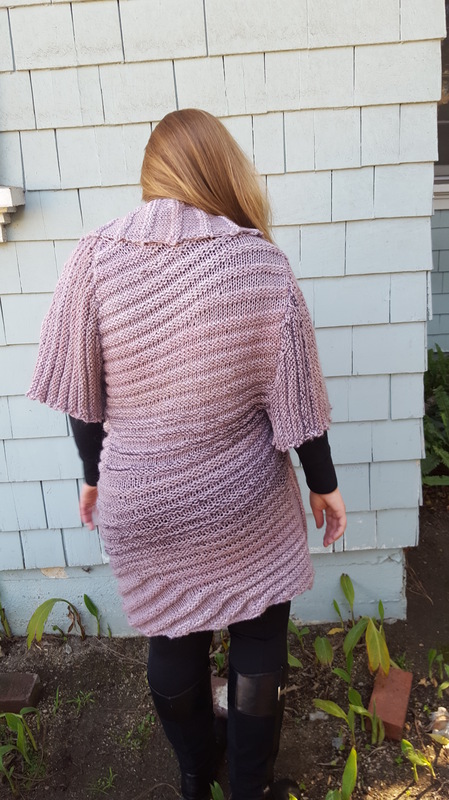 I love how the pattern uses the short rows as a design element, and because of this, you don’t need to pick up and hide your wraps. 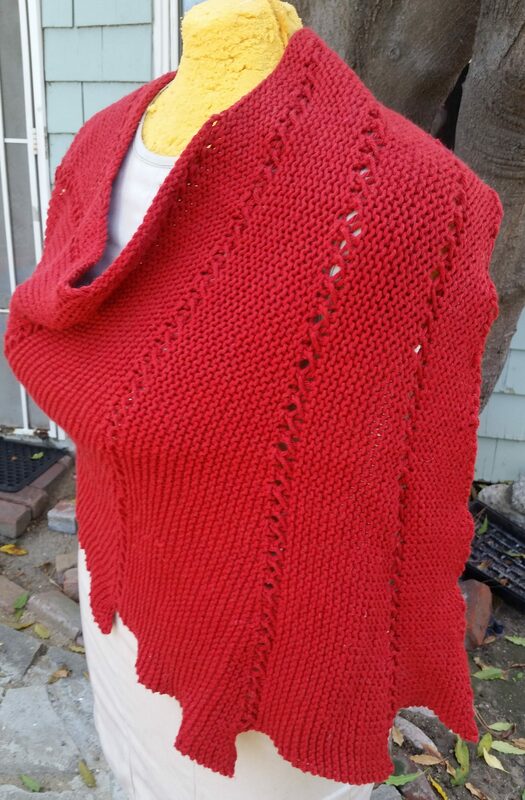 I am thinking it would be fun to do this pattern again in a variegated or gradient yarn, but I am also very happy with the solid tomato red. 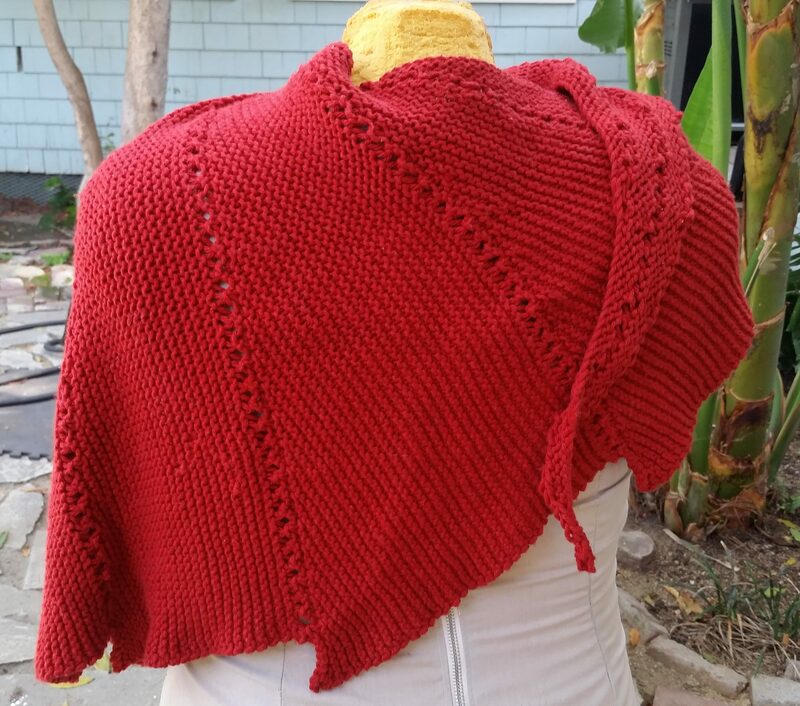 Fall is not particularly cool in Los Angeles, but this color is very fall-ish while the cotton makes a cooler shawl than wool would have. 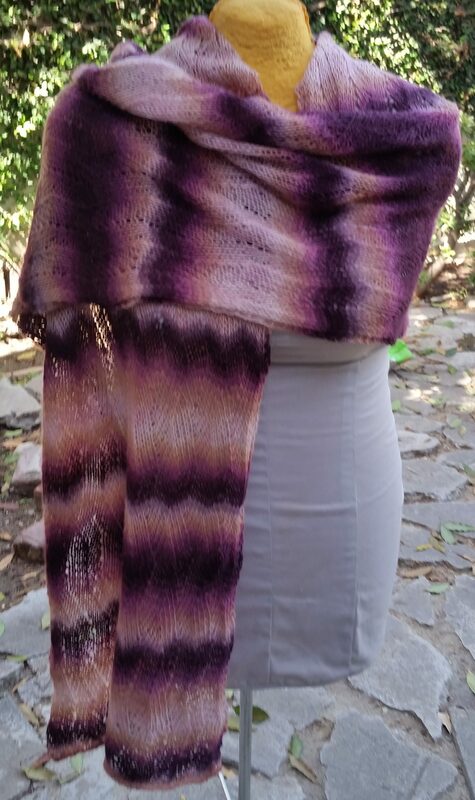 I also really love the jagged edge of this shawl – great shape when you wear it wrapped around yourself! Our knitting guild has a very nice holiday party every year, and for the 2017 party, as part of the fun, they did a fandom challenge. The challenge was to make something from start to finish in 2017 inspired by anything we were a fan of. Other than that, the challenge was wide open for creativity. 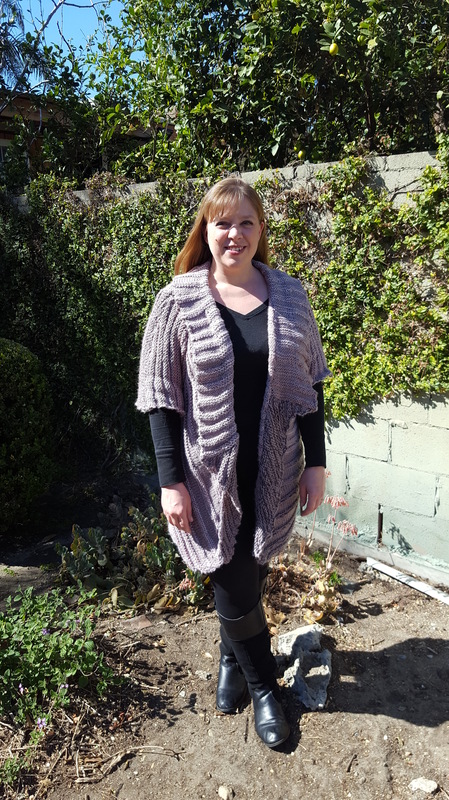 This Welted Coat, designed by Irina Shabayeva, had been in my queue ever since it first appeared in Vogue Knitting. I had just started knitting when that issue was published, and so I was definitely too intimidated to begin such a complex pattern. But since I am a Project Runway fan, and Irina was my favorite winner, I realized it was the perfect challenge. 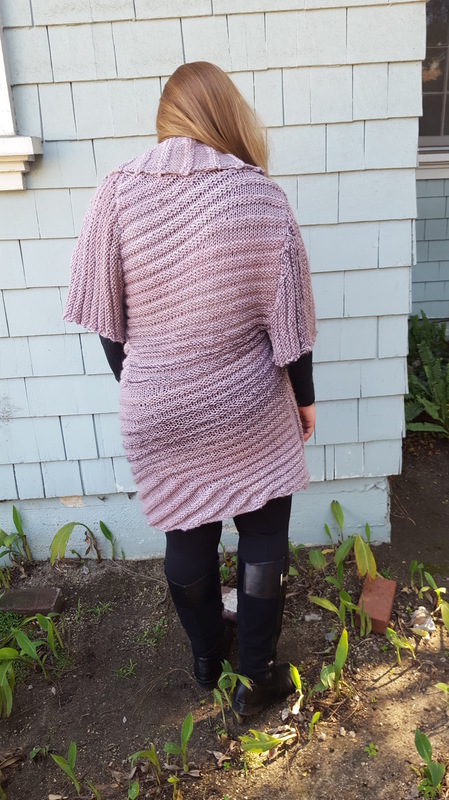 Side view – I love this coat. It hugs the body without being tight or uncomfortable. The knitting process for this project was surprisingly fast and easy. It’s knit in worsted/aran weight yarn on size 11’s, so it goes fast. 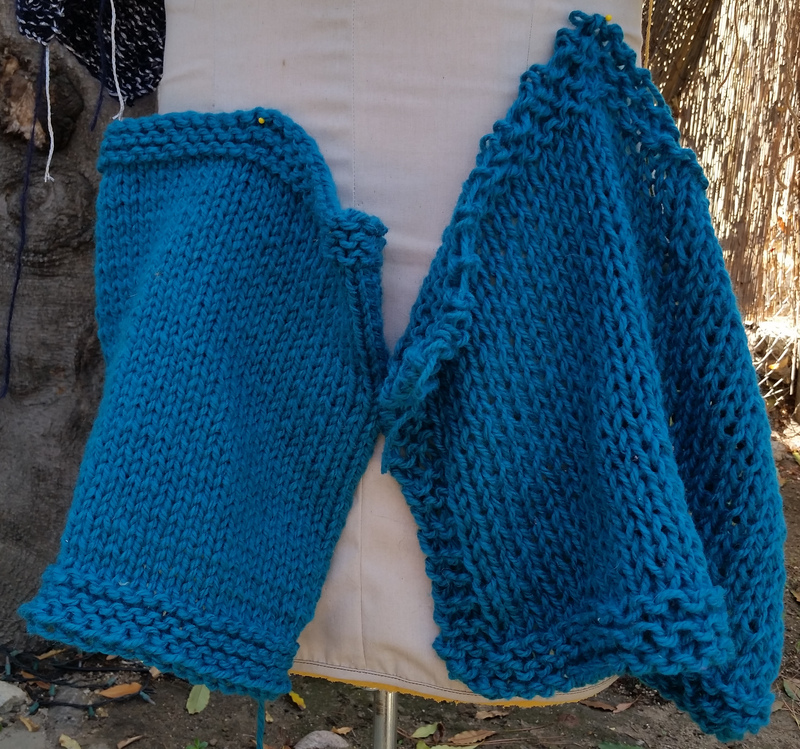 Even a relative beginner wouldn’t have too much trouble doing the knitting for this project. The challenge comes in the construction. If memory serves correct, it was a total of 12 or 13 separate pieces that are sewn together at the end. The pattern is not overly detailed about the sewing portion, nor are the schematics that helpful. 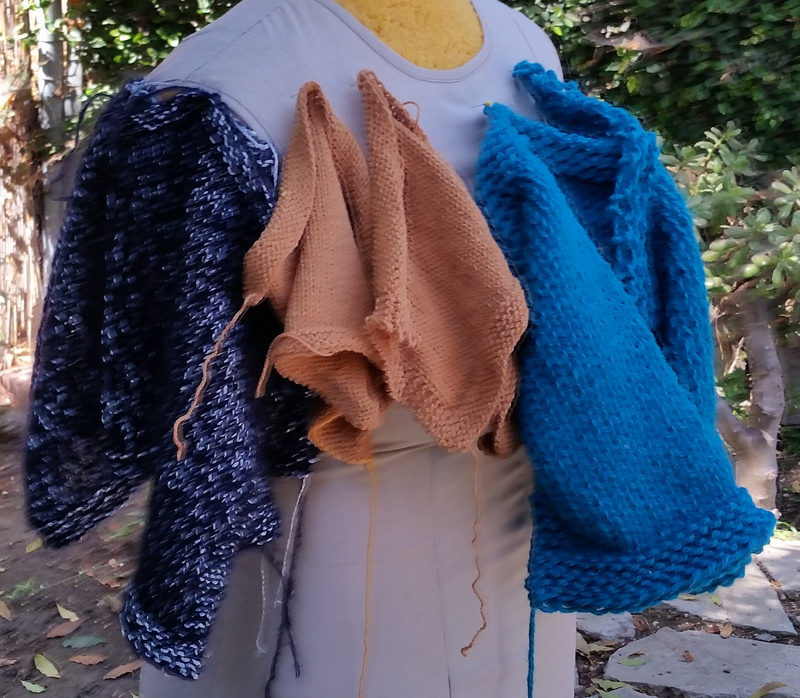 In truth, the most helpful thing in constructing the garment when I was done with the knitting was my mannequin. When I pinned the pieces together on the mannequin according to how the instructions said to sew it together, it started making more sense. But it took me two full days to do the sewing and finishing (much of which was spent just figuring it out), and I was very grateful I had extra time to myself over Thanksgiving to get it done. This is probably 7 separate pieces in view here. Complicated construction, but have to say, the fit is flattering when its done! Dealing with the construction issues ended up being worth it, and I am so happy to have this coat. It goes with everything, is flattering and so comfortable to wear! During the cold months, I wore it with everything, and gives the sensation of wrapping yourself in a cocoon. I am glad I made it in a relatively neutral color, and will wear it for years to come.